I feel sorry for Evil. I really do. I think Terry Gilliam does too, as he gives him the best lines, makes you sympathise with his underdog status in his eternal fight with the Supreme Being, and it genuinely seems like he's been dealt a bad hand and never given the promotion he deserved at work. Where he does win is in the way that David Warner, the actor who played Evil in Time Bandits, brilliantly steals the film from under the noses of similar screen-hoggers. Oh, hello! It was good, wasn't it? To be honest, that last line could apply to Time Bandits too. This is easily Gilliam's most accessible and fun film. I'd go so far as to say it's ruddy perfect. It really is. There's a coherent plot, brilliantly realised special effects, fantastic locations and sets, coupled with a cast that means you aren't 30-seconds away from a famous name. But, that isn't a hindrance. They all play their roles with such naturalism that it makes the fantastical elements seem incredibly real. Terry Gilliam is a man in love with visuals. He has a style all of his own. Unlike Tim Burton, who's singular vision can become a tad Burton-By-Numbers the more films he makes, there's never anything like that with Gilliam. In fact, Gilliam-By-Numbers would be a surreal and crazy affair, simply because he'd tear up a numbers chart, throw it in the air and try and make a beautiful shot from the confetti that rained down. You just cannot predict what Terry Gilliam will do. He's like Orson Welles for the geek generation. Like Welles, he's battled film companies and gone elsewhere to find finance and promised films that have never been delivered and inspired younger filmmaker's with his cinematic vision. He's a maverick and determined to stay one. He's also a rebel who, in my opinion, sometimes rebels simply because that's his nature and not because it's right for the project. I don't think you could ever call any of Gilliam's films 'easy' in terms of production. He fights for what he wants. Time Bandits is a low budget Gilliam but you'd never know it. The tricks he uses to make the budget stretch and the treats he puts on screen for an audience to marvel at are celluloid sustenance. The pairing of his artistic genius and the independence of Denis O'Brien and George Harrison's Handmade Films (who financed and produced Time Bandits) seems, to outsiders, to have been a perfect match. It's been said in interviews since that Gilliam caused such a fuss after the film was finished that George Harrison's song that plays beautifully over the end credits is actually a demand for Gilliam to apologise! 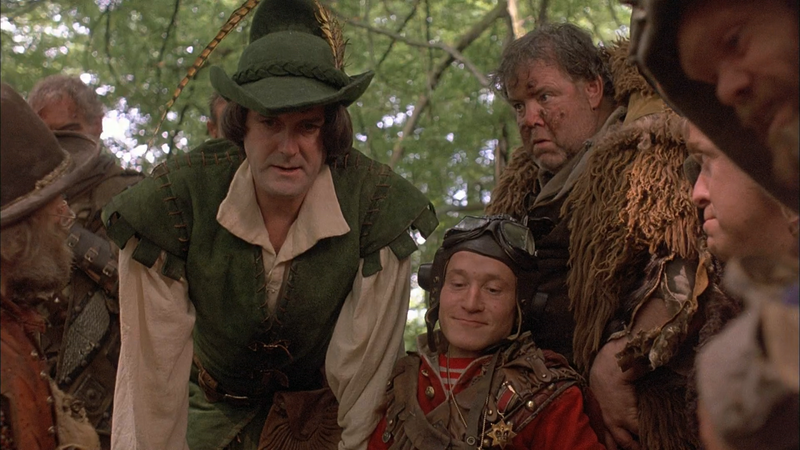 For me, Time Bandits is a film where the director has found his feet but isn't quite confident to fly solo. He employs Michael Palin, his Monty Python cohort, to co-write the script for example (and uses him in a running gag about a pair of lovers through generations which is very funny). Palin's reining in of Gilliam's excess and genius of writing characters is evident in the script and finished film. The cameo of fellow Python alumni, John Cleese, as the most facetious Robin Hood (and the funniest) in history was originally written for Palin but Cleese pulls it off with such sublime skill that I wish they'd developed a spin-off for his character – who treats the poor as if he's on a Royal meet-and-greet. So, what's it about? Well, essentially, a band of dwarves who used to work for the Supreme Being have stolen a map that shows holes in the space/time continuum. This means they can jump through different periods of history and become the richest people on the planet by plundering the wealthiest of wherever they leap. They accidentally bring a young boy called Kevin along with them when one of their first leaps lands them all in his bedroom, with the Supreme Being in tow. The subsequent image of the Sir Ralph Richardson's blanched face, as the Supreme Being, chasing them down as they try to escape through the Time Hole that's behind the moving wall of Kevin's bedroom is both surreal, unnerving and unforgettable. As always with Gilliam, this is a comedy but with an underlying current of horror and darkness and surrealism. Craig Warnock as Kevin is a revelation. He's real. He can act but he doesn't overact. He feels like you would feel, talks like you would talk and behaves as you would behave. Child actors are difficult things and but Craig feels perfect. This is probably because he was accompanying his brother to the initial audition, rather than being there for the audition himself, and his ability to play the role of Kevin so realistically means he really should have gone on to have a better career than he enjoyed. The plot hangs together because of this initial chase for the map, with both the Supreme Being and Evil being after it. It's essentially a series of sketches in the middle of the film, hung together on a dramatic narrative, but it never feels like something that sounds so generic. The ending is both hilarious and bleak, the chase itself proves fruitless and the Supreme Being turns out to be like a Headmaster scolding his pupils than someone who took six days to create the universe. This is why it's such a beautifully different film. As a supposed 'family' movie, I guess the band of dwarves are there for the kids to empathise with (alongside Kevin) but they are so much more than that. It's like they're a mini-Monty Python team in themselves. David Rappaport leads them, with such hilarious and empty bluster, that it's interesting to know he separated himself from the other dwarves when filming; believing he was above their level, as it were. Certainly, the John Cleese of the group. I'll let you have the fun of picking who Kenny Baker, Malcom Dixon, Mike Edmunds, Jack Purvis and Tiny Ross are supposed to be! To describe much more would feel wrong, if you're reading this and you haven't seen it. But, the stand-out performance for me is Evil himself, played by David Warner. In his underground lair, he's like a middle-management do-gooder, surrounded by incompetents and prone to bouts of irrational anger when things aren't going his way. And I haven't even mentioned Sean Connery yet. I love the anecdote that Gilliam and Palin wrote, for Connery's character in the script, a casting suggestion that said 'A Connery type – or someone who will work for a lot less money' and, in the end, they got the man himself to fulfil their requirements! 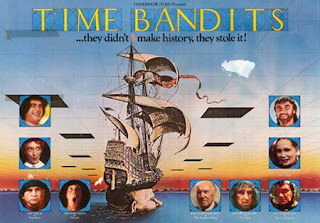 For a newcomer to the filmic work of Terry Gilliam, I'd suggest starting at Time Bandits. If you're a Gilliam aficionado, though, I'm pretty sure you'll agree with me and put Time Bandits up there in his Top Three. Me? I'd put it at the very top every time. There has been talk of a Time Bandits series and I can see how the idea came about because the Map of Time Holes can be extended to every important or non-important historical event and era. But, I think that's a very bad idea. The thing with Time Bandits is that it shows you these little vignettes and allows your imagination free rein to create others where they might have been. It's not diluted by having way too many periods where the midget marauders take treasures. Just because it seems like you can extend a film, it doesn't mean you have to. That's what imagination is for and that's why I admire Terry Gilliam so much; he may not have the finances or play the system well enough to be anything more than a pain in the backside for big studios but he gives you big, expansive stories with open endings that you can imagine a whole universe surrounding. And then he leaves you to fill in the blanks. BEJ: Did you have to audition for the part of Evil? If so, what do you remember about the experience? If not, how did you feel when you were offered the role? DW: No - just a meeting with Terry Gilliam, and just delighted to be offered the job. I read 20 years later, in a book I casually picked up, on the films of Terry Gilliam - that he'd originally wanted Jonathan Pryce - who was unavailable. (Of course, nobody told me at the time). 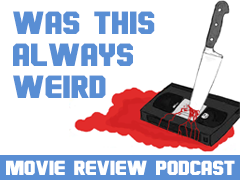 BEJ: For someone who seems very lovely in interviews and from personal appearances, you did seem to get stuck in an 'evil' run of roles in the 1980s. 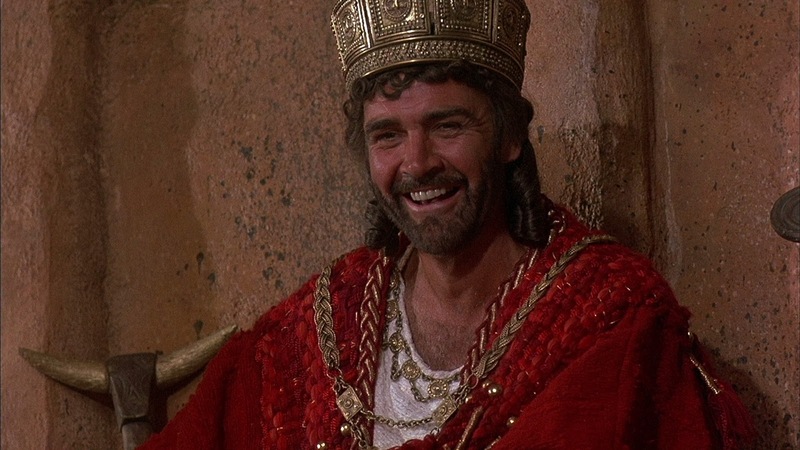 Was this Hollywood typecasting and were you happy to be playing the villain most of the time? DW: Of course I've played plenty of roles who weren't villains - but maybe you haven't seen those! Having said that; I didn't really enjoy playing villains, but you have to earn a living. BEJ: The rushed production schedule of 'Time Bandits' meant that Terry Gilliam has been quoted as saying he was re-writing and altering things on set. Were you aware of that? Did you feel any pressure on-set? DW: If there were such problems, I certainly wasn't aware of them. BEJ: For me, your performance and character is the stand-out role in the entire film, with a deliciously sarcastic and exasperated edge to the apparently smooth deameaour of Evil. Did you base it on anyone in particular or was the character fully-formed from when you read the script? DW: No - I didn't base it on anyone. I suppose it's just another extension of me. BEJ: How was Terry Gilliam's directing style and is he comparable to anyone else you've been directed by? DW: It was hard work, but fun. Sometimes it was physically difficult, but Terry Gilliam was such a great bloke, that you'd do anything for him. BEJ: If you could describe Terry Gilliam in three words, what would those words be?! BEJ: Did you get a choice in costume design or suggest any alterations or was it something you were just given? DW: I went to see him. All sorts of different things were tried on my head - and experimented with several looks. But the final decision was soley Terry G's. BEJ: Was it uncomfortable to wear or did it inform your character? BEJ: For me, Gilliam's fantasy is always grounded in reality - none more so than the naturalistic performances from the actors he casts. 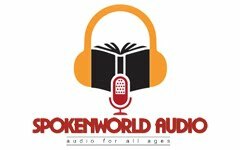 Could you find a realistic grounding for the character of Evil?! 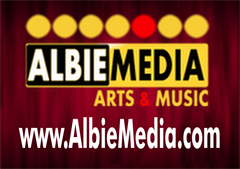 BEJ: Have you ever considered directing yourself? If so, what would have been your dream film to have directed? DW: No. I couldn't direct myself in or out of a paper bag! 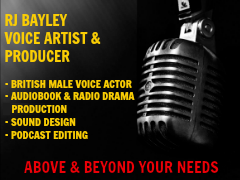 BEJ: It's impossible to pigeonhole you as an actor, as you've played such a vast variety of characters over stage, film, television and radio. Is there one role you wished had come your way that you would have liked to play? DW: No…. however, there have been one or two roles that I was unavailable for, and other actors played them; but having seen their wonderful performances; I was glad I was unavailable. 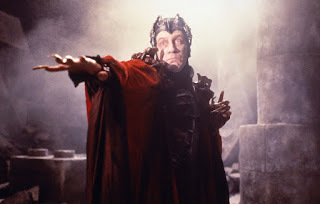 BEJ: And, if there ever was a Time Bandits 2, would you like to have a crack at Ralph Richardson's role as God in an about turn to your original role?! DW: I always consider any offers!